This is 26th January – the day we as a country got ourselves a new identity. The new identity needed some symbols – Symbols of India that collectively reflect the different aspects of the country. So this republic day, Let me take you around India with National Symbols of India. The Lion capital from a pillar of Ashoka found at Sarnath near Varanasi can now be seen at ASI Museum in Sarnath. As soon as you enter the museum, the giant sculpture of 4 Asiatic lions facing four sides welcomes you. Lions sit on a pedestal with the relief of a wheel, a horse, a lion, a bull and an elephant. This pedestal, in turn, sits on an inverted lotus. I have seen lion capitals at places like Vaishali in Bihar, but since this one at Sarnath is in front of you – one realizes the size of the capital. They say a huge wheel with 24 spokes used to sit on top of this capital. Remember, Sarnath is the place associated with setting the wheel of dharma in motion. This is where Buddha gave his first sermon to his first 5 followers. The lion capital together with the verse from Mundaka Upanishad saying Satyamev Jayate (truth alone shall triumph) completes the emblem. It can be seen on all the government stationary and all the visiting cards of government officials. Of course, you can see it on all possible currency denominations. Read more about others things to see in Sarnath. Lotus flower is found literally across the country. If you travel across India, you would appreciate that Lotus truly is a flower to represent India. My favorite place to spot Lotus is in small ponds in villages across India. I remember we saw blue lotus at ponds of Sibasagar in Assam, in villages of Goa we see small versions of Lotus along with big ones. When you see the water floating on the leaves and petals of the lotus, without impacting it a bit – you know why Lotus is such a revered flower. Lotus can also be found in ancient Indian art across the country. It is seen in both Hindu and Buddhist iconography. It is a symbol of purity & auspiciousness. Check out this list of Rural Tourism Companies in India. Royal Bengal Tiger is found only in the Indian subcontinent. Once upon a time, it could be found in most regions of India – if you do not believe me, look at the small Gram Devta temples where you will always find a tiger in some way or the other. Unfortunately today you have to travel some distance to meet these royal tigers. Thankfully, their population is increasing once again. I had a close rendezvous with a male tiger called Munna in Kanha National Park and a female tigress called Collarwali in Pench National Park. Other good places to see tigers are Sunderbans in Bengal, Ranthambore in Rajasthan, Bandhavgarh National Park in MP. There are many tiger reserves across the country but not many are open to the public or have enough tigers. River Dolphin or Susu is the freshwater river Dolphin that used to be found in abundance in River Ganga. Other major rivers like Brahmaputra and Indus also had their share of river dolphins. At this point in time, your best bet to see an in-situ River Dolphin is Chambal River that still has some riverine ecosystem left in it. Although the reducing depth of the river is posing its own problems for the Dolphins. Do you know there is even a Vikramshila Gangetic Dolphin Sanctuary in Bhagalpur, Bihar? Banyan tree is a native Indian tree and can be traced back to all ancient Indian literature. I had goosebumps when I saw the 5 Vat Vriksha or 5 Banyan trees that make Panchvati near Nashik. It is under this tree that Buddha attained Nirvana in Bodhgaya. You can still visit Mahabodhi temple at Bodhgaya and see a descendant of the same tree. Buddhist devotees pick up the fallen leaves of this tree and take them home to worship. You are not allowed to pluck leaves of this tree. Remember the stories of Vikram & Betal, all happened on a Banyan tree. Because of the cyclic nature and self-perpetuating qualities, Banyan tree is considered sacred. It is interesting how some of the symbols of India depicts the philosophy of the land. A lot of places in India claim to have the biggest Banyan tree. It is impossible to find the original tree trunk most of the times as the child trees are almost as old as the parent. The biggest Banyan tree I have seen is near Bangalore – somewhere in Mysore Road, I think. It is an experience to walk around the tree as if it is a palace in itself. You can easily be lost in the labyrinth. India’s national bird Peacock is a colorful and beautiful bird. You have to see it dancing with its feathers open when it is trying to woo a peafowl. Peacocks again can be found across India but I have seen most of them in Rajasthan. In Pench, I saw him beautifully posing on a tree branch showing off its colors. Who does not know Ganga in India? It originates from the Himalayas in Uttarakhand, then it flows through Uttar Pradesh, Bihar & Bengal before merging with the Indian Ocean in the Bay of Bengal. You can visit Ganga at any part of its 2500+ km length. My favorite place to visit Ganga is in Varanasi. I know it is not clean enough there, but the ghats of Ganga at Varanasi have to be experienced, they can not be explained. I also enjoy Ganga at Rishikesh, especially with its newly built Aastha path that lets you walk with the river peacefully. Although I am yet to go to Allahabad, where the three rivers meet. Ganga though is one of the iconic symbols of India. You can see it on top of any government building. Indian flag becomes ubiquitous on Republic Day and Independence Day. On 15th August it graces the historic Red Fort in Delhi. However, on your next visit to Delhi see it atop the Indian Parliament. Read More – How to visit Indian Parliament. I do not think any Indian would disagree that Mango is the kind of fruits. Now, what Mango you like is purely a function of which one you grew up eating. I love the Khatta Meetha Banarasi Langda or Chausa. People in western India swear by Alphonso or Hapus that I never developed a taste for. In Hyderabad, it was Bainganpalli mango whose one piece was good enough for a meal for two. Whichever Mango you like, make sure you pluck and eat straight from the tree at least once in your life. What is your favorite Mango? Hope you enjoyed this journey with Symbols of India! I like how you have got these individual symbols into a string to make this a sparkling example of the most known and loved national symbols. Kudos to you for that! Thank you Enakshi. It our our sheer love for India that we have tried to share through this post. Happy Republic Day. u ran us through the symbols in a very nice way. symbolic of yr. creative style of writings. Thank you Dr Karthik for your encouragement. Happy Republic Day. This was a lovely post to review symbols that we have all grown up with. Thanks for writing! The last picture with the lady and the mangoes took my attention. How did you manage to create shades of black and white + colors in the same picture? Thanks, Divya. Glad you liked the post. The camera I use has a feature where you can click using selective colors. I think I selected yellow, so all other colors were black & white exvept yellow. I assume it can be done using photo editing software as well, but I have not yet tried that. Langda or chausa mangoes are also famous in west Bengal.If you want to taste those,so come The Maldah district in west Bengal which is well known as the Mango city of India. Yes Souvik, will come to Malda once for its famous Mangoes. But remember that according to the National Investigation Agency of India Maldah is believed to be a hub of fake currency. As the Bangladesh border is near of this district of West Bengal, fake currency come in to from Pakistan via Bangladesh. Thank you, Divya. I just wrote it on a whim, but looks like most readers loved it. Probably should do more such features. Keep sharing your thoughts. Great to read the post. very informative. Thanks a lot 🙂 Greetings. Thank you, Rupam. Belated Republic Day Greetings. Thank you for a nice post. 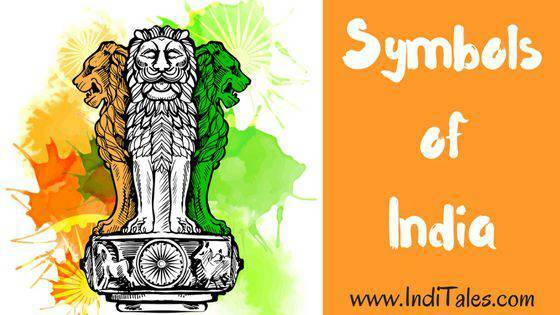 Everyone should know about symbols of India….Reminded me school days when we use to learn about them for GK exams. Thanks, Swati. I hope too that everyone knows symbols of India, I discovered many them while travelling. You are right Isha. I also felt like I was in school while I was writing this. One of those times when you let the child in you take over. There are no rules and regulations to adopt National animals and birds, besides it there are not Notification declaring Lotus as National flower of India. Naresh Ji, Do we need rules and regulations for these things that we cherish? Lotus is a flower that is found across India, is considered auspicious in all faiths and is the native flower of the land. I did not check the notifications before writing this. Thank you for mentioning the details about our nation and its symbols. Kavita, this is a post that I really enjoyed writing. Glad you liked it too. Glad you liked it, Akshay. Glad you liked it Geeta Bhabhi. National Aquatic animal is River Dolphin and National Heritage animal is Elephant. Understanding the meaning behind each of the above symbols is an excellent way to learn about and appreciate Indian culture. Purveyors of art, film, and religious texts will note that these expressive symbols appear consistently. Right Rishika. Symbols carry layers of meaning and culture within them.